Ivory Coast or Côte d'Ivoire,[lower-alpha 1] opisyal na Republic of Côte d'Ivoire, an syudad na manunumpungan sa sur baybayon kan West Africa. Yamoussoukro an kapitolyo politikan , mientras an kapitolyo kan ekonomiya iyo an porteng syudad na Abidjan. Nasa hangganan ini It borders Guinea kan Liberia sa sulnopan, Burkina Faso asin Mali sa norte , Ghana sa subangan, asin Gulf of Guinea (Kadagatan Atlantiko) sa sur. ↑ The latter being pronounced /ˌkoʊt diːˈvwɑːr/ Script error: No such module "Respell". in English and Plantilya:IPA-fr in French. ↑ "Côte d'Ivoire". CIA Directorate of Intelligence. 24 July 2008. https://www.cia.gov/library/publications/the-world-factbook/geos/iv.html. Retrieved on 8 August 2008. ↑ "Côte d'Ivoire". CIA Directorate of Intelligence. https://www.cia.gov/library/publications/the-world-factbook/geos/iv.html. Retrieved on 18 February 2017. ↑ 3.0 3.1 "Côte d'Ivoire". International Monetary Fund. https://www.imf.org/external/pubs/ft/weo/2018/01/weodata/weorept.aspx?pr.x=83&pr.y=8&sy=2018&ey=2021&scsm=1&ssd=1&sort=country&ds=.&br=1&c=662&s=NGDPD%2CNGDPDPC%2CPPPGDP%2CPPPPC&grp=0&a=. ↑ "Cote d'Ivoire definition". Dictionary.com. 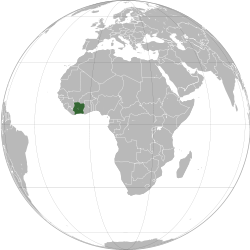 http://dictionary.reference.com/browse/cote%20d'ivoire. Retrieved on 23 May 2014. Ining pahina huring pinagbago kan 28 Pebrero 2019, alas 03:18.